If 2004’s Dawn of the Dead remake might have kick-started the interesting in all things zombies, then video games such as Capcom’s Dead Rising are maintaining interest in the genre. Capcom’s survival horror franchise is making a return as a launch title on Xbox One with the help of Capcom Vancouver, which developed Dead Rising 2 as Blue Castle Games before being acquired by the Japanese publisher. 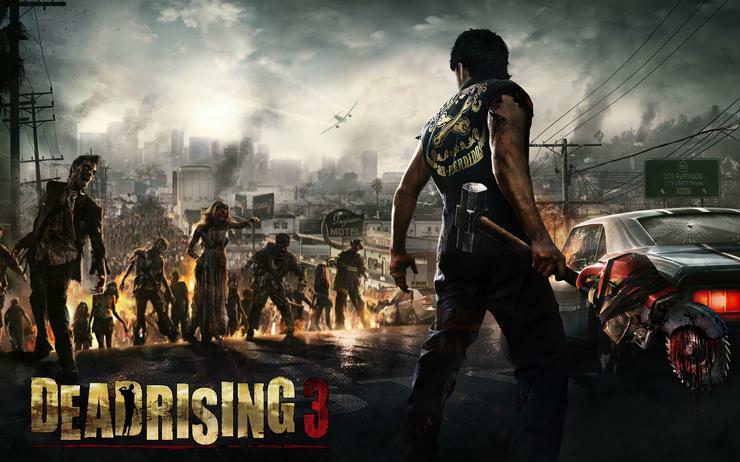 Bigger in scope than before, Dead Rising 3 aims to take the zombie survival experience to a whole new level of terror. We caught up with Capcom Vancouver producer, Mike Jones, during the Xbox One showcase to talk about the development of the third instalment. What has been your first impressions of Xbox One? Capcom Vancouver producer, Mike Jones (MJ): From a developer’s standpoint, it has been a dream for us, because our game has been somewhat constrained by current generation of consoles. We have always focused on number of zombies, items, and physics objects, so density has been the hallmarks of the Dead Rising franchise. However, with the previous games we have been limited by the extremely small play spaces. We’ve had to partition off the loading zones with hard loads, which really interrupted the experience. With Xbox One, we’ve been able to create fully streaming open worlds that are exponentially larger to create the most ambitious game yet. What are the immediate improvements? MJ: There is more density, zombies, and objects without the hard loads. In addition to that, we’ve been able to give the game dual upgrades. We’ve been able to increase our rendering engine for Xbox One, so we have more sophisticated materials on the characters and geometry that we weren’t able to do in the earlier games. So we’re able to make a prettier and larger game without sacrificing any of the density in the gameplay experience. What has been the development experience with the console? MJ: For us it has been a wild rollercoaster ride, because we’re doing a launch title. While rewriting the engine and developing the game, we’re working with Microsoft while they are still developing the hardware and SDK. Luckily, we’re in Vancouver and they are in Seattle, so we get to visit each other all the time, so our sections works closely together. The rollercoaster ride has been to push the boundaries of what we want to do with our game. If we run into some technology that we’re dependant on from Microsoft, we get that and push a bit further. Then we find out we want to do something else and take it to Microsoft, asking them to help us with it, and they will make tweaks to their development kit. MJ: The back and forth as we’re approaching launch day has been one of the bigger project management challenges that we’ve had to deal with, in addition to doing the best game that we can. Every launch cycle we’re your trying to make software for hardware that isn’t finished yet is always a crazy juggling act of priorities and collaboration. Microsoft has been great, not only their R&D teams, but also their regional teams, such as the one in Australia, have been phenomenal. How has Microsoft ramped up its level support for developers with Xbox One? MJ: Capcom is a developer and publisher, but this time we’re actually published by Microsoft. As a result, we’re pseudo second party this time around. The Dead Rising franchise itself has a long history with Microsoft, with the first game being exclusive to Xbox 360. When we were planning what to do with Dead Rising 3, it was breaking the bank on what the Xbox 360 could do. Microsoft started giving us guidance in what we can expect in terms of next generation hardware and that is how the relationship was born. We made some prototypes to show them and they provided us with feedback that we used to tweak it. Why was Dead Rising 3 a good fit for Xbox One? MJ: Ultimately, we understood that Microsoft wanted this game to be a part of their portfolio, and one that shows off their new hardware. We loved the idea of focusing on a single platform to provide the best experience that we could, and bring Smart Glass and Kinect to the fold. It was a match made in heaven, so to speak. Microsoft’s R&D guys always loved the franchise, so it couldn’t have been a better relationship. Geographically being so close has also been helpful, as we can just talk face-to-face after a quick drive. That has been very helpful in understanding each other’s obligations and goals. What aspect of the Xbox One appeals to you the most? MJ: It has to be Smart Glass integration, and we’ve already received a lot of accolades from what we’ve been trying to achieve with it. We just set out to do something that was convenient and something a gamer would actually want to use. Smart Glass seems like an exciting way to extend the gaming experience beyond the screen, either to someone sitting beside you or stay connected to a game you like. Another thing is Cloud computing, and how that is going to change gaming worlds, especially with online multiplayer. What people are going to start doing with the Cloud is also exciting. What is the potential of Cloud computing with Xbox One? MJ: Xbox 360 really brought multiplayer to the masses with Xbox Live, and brought a complete evolutionary shift in console gaming. I can feel a similar thing coming along with Xbox One, except this time it is not solely focused on multiplayer matchmaking experience. As a developer, you’re free to use it as you want and we’re just seeing the tip of the iceberg. We’re using it for our asynchronous game saves to improve on the co-op mode we had in Dead Rising 2, where you could only gain experience. Even if you’re playing co-op not as the main character, you can have your story progress saved. As time goes on, you’ll also see more and more things achieved with this processing power. What has made Dead Rising franchise popular? MJ: There are lots of zombie games on the market, and the genre itself is popular now. What resonates with a lot of gamers is the idea of player freedom. Being able to create your own adventure and the freedom that comes with that is what is really attractive about the game at a conceptual level before it is a zombie game. The appeal comes down to it being a sandbox that you just jump into and you’re free to go on your own adventure. How is the the game cutting edge on a technical level? MJ: We have a huge streaming world, one that is exponentially longer than in previous Dead Rising games. You can put the first two games together and they will fit within Dead Rising 3 multiple times over. So it’s bigger and better, with more zombies and weapons than ever before. We’ve upped the ante with combo weapons, where you can now have vehicles, as well as a much richer co-op experience. As the game has been coming online on the Xbox Live servers, the co-op mode makes the whole experience fresh. Even after getting a bit sick of the game during debugging, going online with co-op all of a sudden makes it a fresh experience and revitalises it. Everything a Dead Rising fan loves about the series is still there, and the good news is that you can now play it at your own pace or the classic mode with a timer. How do you decide what objects are included in-game? MJ: There are a lot of factors, such as fiscal constraints and considerations around variation. You want to ensure that there is a nice balance in the variation of weapons and vehicles. We also need to think about the animation sets, as we can’t come up with custom animations for each of the objects. You have different handholds and grips for each of the weapons, and that is all data you need to stream and network. There are technical considerations, as well as design and resource consideration. We just get in a room and fist fight it out on what to include in the game. Of course, there is stuff left on the cutting room floor, but most of the best ideas made it into the game. MJ: I would go to my friend Clark Crawford’s house, which is full of guns and has a beer brewery in his garage. I saw another idea on a t-shirt, the concept of taking treadmills and putting them outside of the house. So when zombies try to get close, they can’t as they get stuck on the treadmill. I thought that was clever, but you need generators or electricity to do that. [Laughs] I would also go to a discount retailer like Costco and lock myself in there.